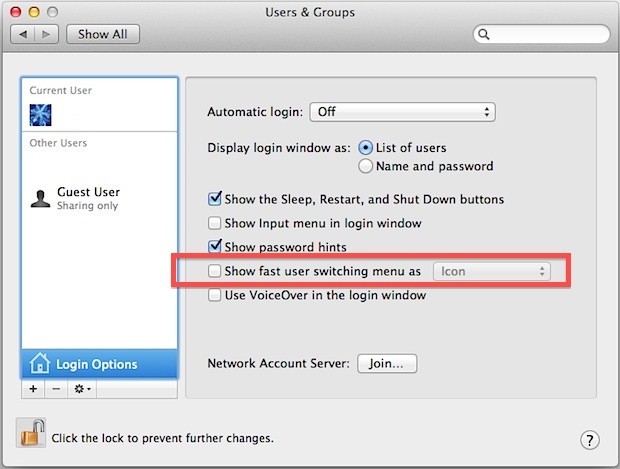 On some fresh OS X installations, you’ll find the user name or login appears in the upper right corner of the menu bar, even if there is only one user account on the Mac. This is actually a feature called Fast User Switching, and the name likely appears in the menu bar due to the Guest Login ability (which can be disabled separately). Alternatively, pulling down the contextual menu next to “Show fast user switching menu” gives you the option to reduce the name to either just the short name or to a simple icon. Unchecking the box makes the name disappear from the menu bar immediately. This does not impact the ability to login with other users on the account though. As to why this doesn’t show up on all Mac OS X machines, it’s likely to be enabled on fresh Mac OS X installations or re-installations, whether clean installs or updates. Update: Apparently you can also remove the user name from the menu bar by holding down the command key and dragging it out of the menu, much like any other menu item. Thanks to @martin for that tip. Just hold cmd while dragging. It is good to have a possibility to switch users as well as have an option to hide user name (to save a space and others not to eye the name while using Mac on public place). However, is there any shortcut to run quick users switch without adding an Apple script or 3rd party apps? This would help to save a valuable menu space, hide the name from the strangers and to keep the users switching feature functional at the same time. I received a Mac OS X for my birthday but there is one issue.. It already has an administrator account and a password that I don’t know.. I would like to know what can I do to delete that account and make another one.. i already have a guest account but that is not enough because I can’t do much, only to watch movies, listen to music or go online.. Can you please help me? When I switched to Lion, I did a fresh installation, but I don’t have that “fast user switching menu”, so I don’t think it has something to with the difference between upgrading and doing a fresh installation. Very very very very thank you!!! This probably happens when you have more than one user on the machine. I didn’t notice my name up there until I created a 2nd user. If you’re the only user there is no need for fast switching between users. Now if you delete the 2nd user and back to only one user the fast switching does not go away and you have to drag it out of there to get it out. stupendous.. i love it. thanks so much. thanks for the quick reply. Solved the issue for me. Thank you for giving a direct answer! very to the point, I like that. I was trying to get my username removed from the menu bar and have now been able to do that as a result of reading this. Thanks very much! Thank you very much – was so annoying!